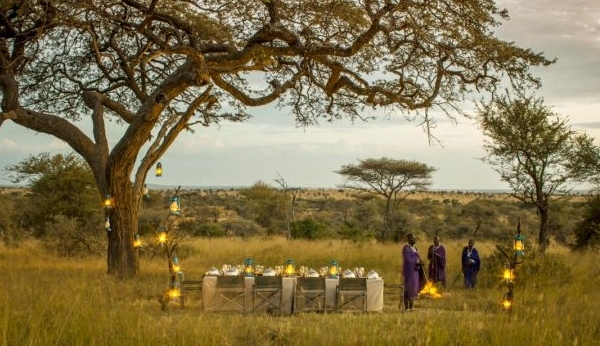 Destination Wedding in Tanzania? Why not! Nairobi National Park, Kenya Nairobi National Park is a unique ecosystem by being the only protected area in the world close to a capital city. The park is located only 7 km from Nairobi city centre. The savannah ecosystem comprise of different vegetation types. Open grass plains with scattered acacia bush are predominant. The western side has a highland dry forest and a permanent river with a riverine forest. To the south are the Athi-Kapiti Plains and Kitengela migration corridor which are important wildlife dispersal areas during the rain season. Man-made dams within the park have added a further habitat, favourable to certain species of birds and other aquatic biome. Major wildlife attractions are the Black rhino, lion, leopard, cheetah, hyena, buffaloes, Giraffe, zebra, wildebeest, elands and diverse birdlife with over 400 species recorded. Other attractions include the Ivory burning site Monument, Nairobi Safari Walk, the Orphanage and the walking trails at hippo pools. Mount Kenya National Park, Kenya Mount Kenya National Park is located to the east of the Great Rift Valley, about 175km North-East of Nairobi. The ecosystem lies in Central and Eastern provinces of Kenya the national park and is encircled by the forest reserve. At 5,199m the mountain is the second highest peak in Africa. Lake Nakuru National Park, Kenya Lake Nakuru National Park, Kenya Lake Nakuru National Park is one of Kenya's two Premium Parks and is a bird lover's paradise. It is renowned for its variety of birds and one the of Kenya's 23 best National Parks and one of two in the Premium Category, by the side of Amboseli National Park. This park lies in Central Kenya, 140km north-west of Nairobi, in Nakuru district of the Rift Valley Province. Surrounded by mainly wooded and bushy grasslands, the ecosystem comprises of the lake. The park supports a wide ecological diversity with Flamingos (Greater and Lesser) and other water birds being the major attractions of the area. Moreover, the ecosystem provides for about 56 different species of mammals including the white rhino and buffaloes and a variety of terrestrial birds numbering nearly 450 species. The surface of the shallow lake is frequently scarcely perceptible for the reason that to the recurrently changing mass of pink. As a matter of fact, there are lots of activities to experience while you are at Lake Nakuru National Park. Here are some of few things to do: Baboon Cliff View Point Witness a great number of flamingos on the lake corresponds with water and food status and the best vantage point is from Baboon Cliff. Makalia Falls Discover the astonishing and scenic attractions of Makalia Falls in Lake Nakuru National Park at the extreme southern end. Game Drive The game drive is the best thing to experience because it is the main attraction for the park's birds. The lake's abundance of algae used to entice a huge number of flamingos that famously edged the shore. Game Viewing You can see the endangered white rhinos and some of the water animals such as hippos, buffalos, waterbucks, and impalas. Amboseli National Park, Kenya Amboseli National Park, By Kenyan standards Amboseli is a relatively small Park (392 square kilometers) yet its wealth of flora and fauna resulted in the recent designation as an International Bio-sphere Reserve. Amboseli, meaning "Salty Dust" in the Maasai language is an important rangeland for the Masai culture whilst the 'salty dust' itself is volcanic ash from the eruptions of the Mount Kilimanjaro a millennium ago. Amboseli lies immediately northwest of Mount Kilimanjaro, on the border with Tanzania. Amboseli was established as a reserve in 1968 and gazetted as a National Park in 1974. The Park covers 392 square kilometers, and forms part of the much larger 3,000 square kilometer Amboseli ecosystem. The Amboseli ecosystem is typical of the open savannah grassland habitats of Eastern Africa, featuring open wooded grasslands, rolling hills and swamplands whilst the presence of Mount Kilimanjaro creates a unique selection of ecosystems found nowhere else on earth. The Amboseli basin is fed by springs that provide a permanent source of water during the dry season, while the river systems north of the basin form a seasonal flood plain that is used by migratory animals during the rainy seasons. Although the region has a relatively low wildlife biomass it supports a greater variety of animals than neighboring Tsavo, which is fifty times bigger than the compact but comprehensive Amboseli. Over 53 species of herbivores and carnivores can be viewed with ease, the most conspicuous being the troops of over one thousand elephant who range the plains and wallow the swamps. A number of other unique animals also populate the area including lion, cheetah, giraffes, zebras, buffalo, rhino, wildebeest, gerenuks, impalas, gazelles, hyenas, baboons, bats and about 425 different species of birds. 3 days amboseli camping safari ,Kenya budget Safari,group joining Amboseli Camping safari, amboseli national park, camping in Amboseli on the slopes of Mount kilimanjaro Tour Duration: 3 Days Group Size: 2 people Destination (s): Kenya Specialty Categories: Amboseli Camping safari Season: January – December Daily departures, subject to minimum 2 persons booking.